Olive Wood is a fruit wood with lovely grain patterns. It is a hard wood which requires sharp tools and it will take a great finish as well. There is a fruity odor as you are turning it. Normally you turn smaller projects with olive wood rather than large bowls. It is fun to try different species and it is not too hard to find some olive wood to turn. 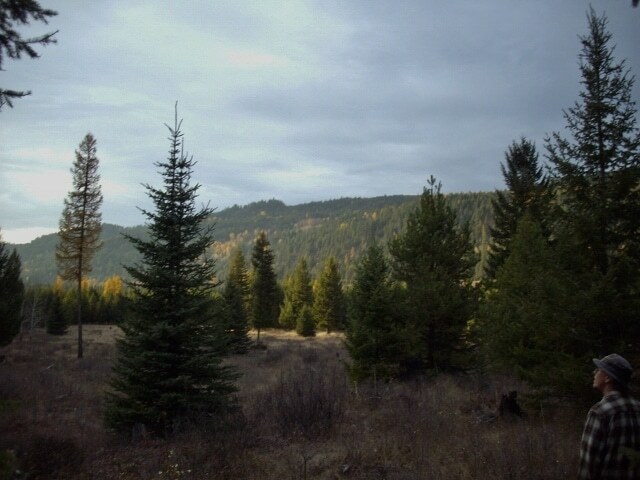 Growing up in Canada, Olive wood was not a common or local wood. Over the years I have found it occasionally at craft fairs and other Christmas events. Usually the booth or table had Christmas decorations and Nativities made by people in Israel. I had not thought of turning with olive wood. It is not a tree that grows in Canada. However it is a wood that I am seeing more of in different products and as turning blanks as well. 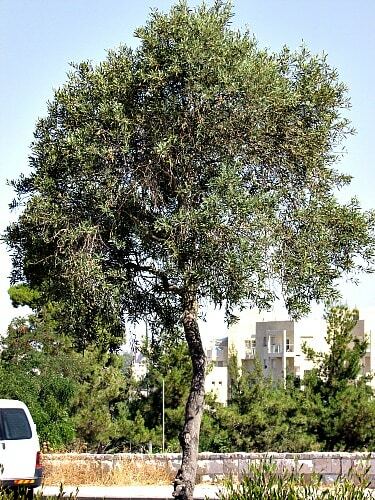 The olive tree grows largely in Mediterranean climates, but successfully grows in some of the warmer regions of the United States. It is a small tree, with bush like tendencies and lots of branching. The older an olive tree gets, the more outer stems fuse to the trunk, leaving wide swaths of unusual grain patterns, burl-like patterns, and annoying knots. The leaves are narrow, oblong and sharply tipped, gray green and grow in pairs. 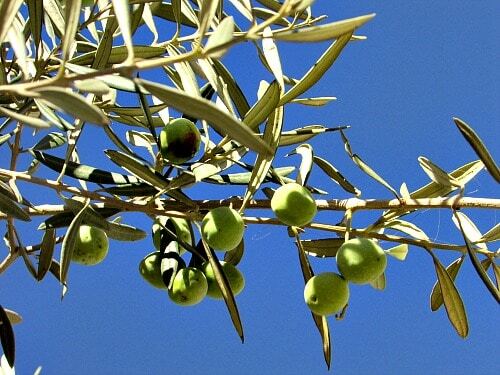 Olives are evergreen, and surprisingly hardy, thriving in zones that are often partially desert. The wood of the olive tree can be highly figured. The sapwood is a light tone, roughly a creamy yellow, stripped with darker brown and green tones. The heartwood is a darker, nut-brown with similar patterns, though the darkest brown tones trend nearly to black. 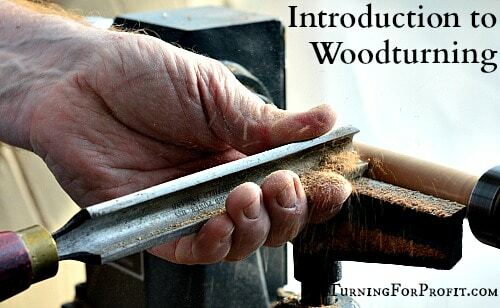 It is a dense wood that can be a joy to turn or carve. 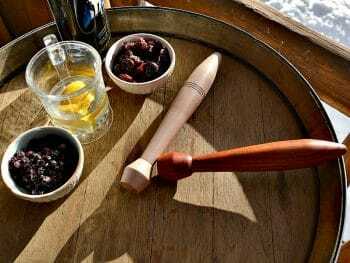 When working with olive wood, one may notice a slight aroma, reminiscent of freshly pressed olive oil or a wine barrel. This scent is due to very high oil content in the natural wood, which means an oil or water based finish may not apply well to your turned olive wood. The wood is very dense, heavy, and strong. Olive wood is a very clean wood, and is unlikely to have many spores due to the oil content and density of the wood. If you are allergic to olives, you may not want to turn olive wood, but otherwise you should be able to enjoy turning it. Make sure your blank has been fully dried; use a moisture meter to check. If the blank has not been fully dried, but sealed as still green wood, olive wood has a tendency to crack and check on the surface. As it is a dense wood, larger blanks are more likely to still be damp compared to smaller ones. Due to the oil content, the wood will turn similarly to green wood, even when it has low moisture content. For decorations, or projects that will not be in contact with food, buffing can bring the natural oil out as a simple finish. If the wood will be in contact with salt, a more impermeable shellac finish may be desired to keep the olive wood’s oil from interacting with the salt. The oil in the olive wood, as well as any residual moisture, can be drawn out with denatured alcohol. After soaking the wood in denatured alcohol, for about a week, it should be re-dried out very slowly to prevent any additional cracking or checking. Wrap the piece in several layers of newspaper and dry for a month or more, then gradually unwrap and continue to dry very gradually. Once completely dry the wood can be finished as normal. 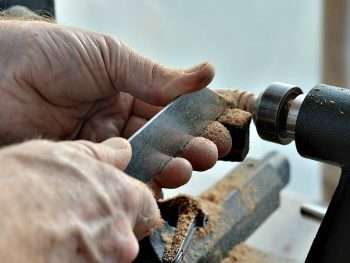 Due to the higher density of olive wood, using the proper tools can mean that your piece will need very little sanding. The wood turns cleanly, though the oil content can cause some slight clogging when sanding. Again, this is similar to working with green wood. Olive wood can be unstable, so take precautions when working with it in larger sizes to insure that it is dry and cracks are filled. Due to the wood’s propensity to move, particularly with humidity changes, creating precise work out of olive wood is not recommended. The best is if you are in a locale where the olive tree grows. Then you can keep your eyes open during pruning season for suitable branches. When a tree is cut down then you could ask for some turning wood. 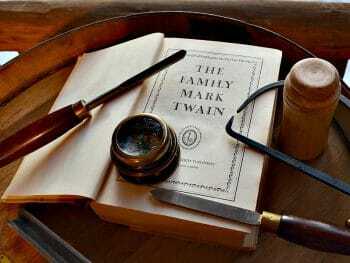 It is a courtesy to turn something out of the wood for the person who gave you the wood. If you pay for the wood then it is all yours. Several woodturning supply outlets carry olive wood turning blanks. These range from pen blanks to larger spindles (3 x 3 x 12) to bowl blanks (3 x 6 x 6). You can also find olive wood at discount home centers. 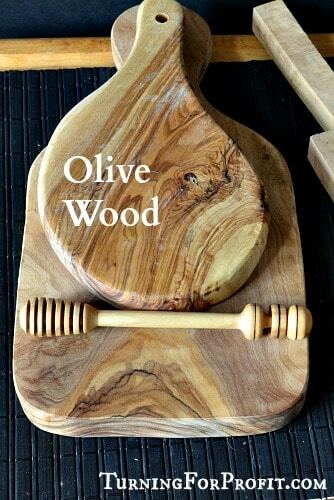 The small cheese board below is olive wood. 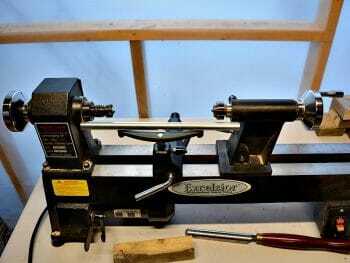 The board is 3/4″ thick, the same as a standard pen blank. You can cut three pen blanks at least out of this wood. This board cost me less than 3 olive wood pen blanks from Lee Valley Tools. So keep your eyes open and you may find there is more olive wood around than you realize. Enjoy exploring the possibilities of turning with olive wood. Remember to keep track of your inventory and the species that you turned the project from. There is something special about olive wood no matter where it grows. I guess that we have a connection with the tree because of its fruit. Customers often show greater appreciation for items turned from fruit wood than any other type of wood. Apple, pear, cherry, plum, and olive, are all fruit wood, have interesting grain patterns, and have selling appeal as a result. I hope you enjoyed learning about olive wood. It was fun turning the honey dipper including the captive ring. I am going to make a jar lid and a fountain pen out of the cheese board that I found. 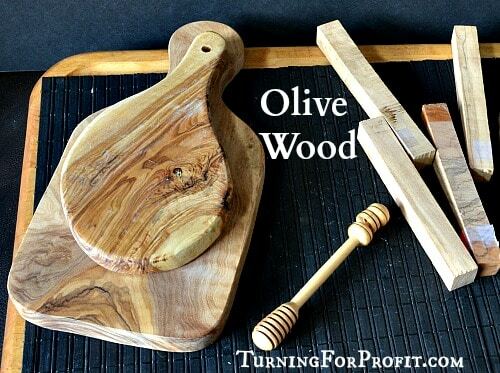 Please share if you have turned a project out of olive wood. 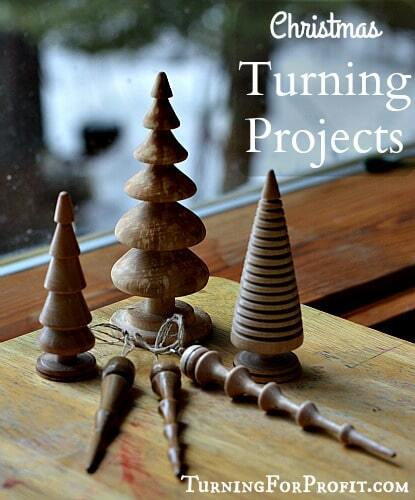 If you enjoy stories like this or different turning projects please sign up for my weekly newsletter. 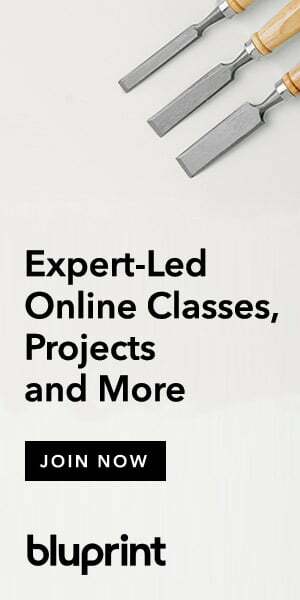 (The sign up box is a little lower on the page.) Thanks for reading this far and remember to always turn safely. 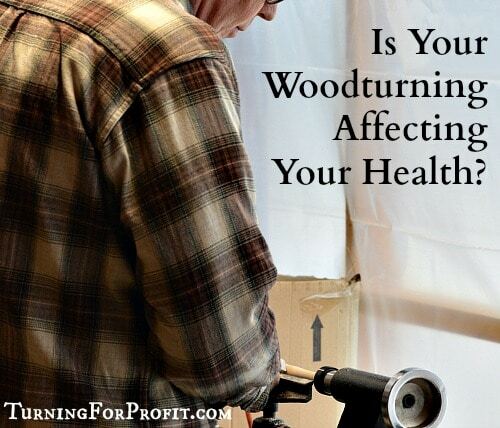 Previous Post: « Is Your Woodturning Affecting Your Health?